Why Buying Springfree Trampoline Makes Sense! You know you want to buy a trampoline for your family. You’ve done the research. You’ve just got one challenge left – convincing your partner. Don’t stress – we’ve got you covered! Check out our guide with everything you need to convince your partner you need a Springfree Trampoline. We get it. Trampolines have a bad rep. They’ve probably heard stats, rumours, story from a friend-of-a-friend about trampolines. But when used appropriately (and with a little common sense) trampolines can be a fantastic addition to your backyard. That’s why we busted the top 5 myths about trampolines. Most people’s first concern with a trampoline is that it isn’t safe. That’s not true. In fact, Springfree is the world’s safest trampoline! Our revolutionary springless design has eliminated 90% of product related trampoline injuries. Learn more about the Springfree safety features here. In a test by unbiased and independent consumer groups CHOICE and Consumer NZ, our Medium Round trampoline was the ONLY trampoline to pass all safety tests. Plus, we were the only one that had no major safety failures! The other 6 trampoline tested either failed structural tests, didn’t protect the user from impact on the frame or enclosure, or had dangerous head entrapment problems or pinch points. Get the full test results here! Nothing is worse than buying a new present for the kids and having it break after just a few months. You won’t have to worry about that with a Springfree Trampoline! Our trampolines are made from the highest quality materials so you can jump for years to come. In fact, the trampoline net and mat rods are made from an advanced composite material that's 3X stronger than steel so they can withstand millions of jump cycles! Learn more about the high quality of our trampolines here. Want your kids to get more fresh air and exercise? Springfree is the answer! Jumping on a trampoline for 10 minutes has similar health benefits to a 30-minute run. 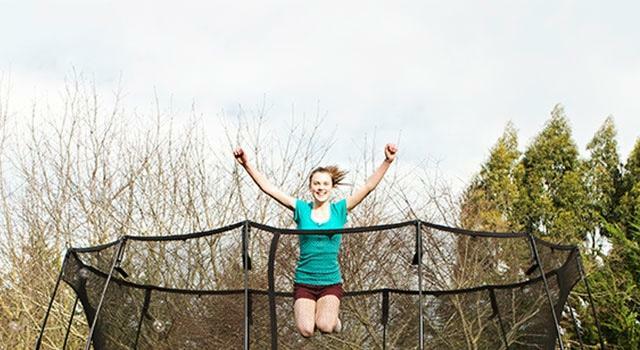 Check out all the health benefits for jumping on a trampoline. World’s safest trampoline? Check! Made from high quality materials? Check! A world-class warranty? Check! Every Springfree comes with a 10 year warranty. Unlike other trampoline warranties that cover specific parts, our 10 year warranty covers the WHOLE trampoline – from net to frame to mat.